An integrated amplifier adds some extra “oomph” to your otherwise tame stereo speaker system, and can actually transform a set of sub-100 dollar speakers into a pretty decent movie sound system or gaming audio solution. Also, if you happen to have a super powerful state-of-the-art woofer capable of delivering window crackling bass, then chances are you won’t be able to make the most out of it unless you get an amplifier. So exactly what is an integrated amplifier? Well, it is basically a pre-amp and an amplifier combined into one system. The preamp amplifies and adds some tone changes to the source signals, while the main amplifier unit adds the power without modifying the signal sent to it by the pre-amp. Thus, the pre-amp acts as volume control + EQ, while the amplifier adds the requisite power needed to drive large speakers or high impedance loads. If you’ve decided which features matter to you the most, then take a look at the following list of awesomely integrated amplifiers that we have put together on the basis of intensive research and customer feedback. Choose the integrated amp that fits into your budget, and make sure it has enough I/O for all your devices at home, along with some room for future expansions. Delivering 44 W of continuous power per channel, with barely any distortion (0.08% THD), the Onkyo A-9010 is one of the best sub-300 dollar integrated amplifiers units if you go by specs alone. In terms of build quality, the entire body is made from aluminum, and there is a polished black coating on the top that looks really sleek. The brushed aluminum finish on the front is going to fit in perfectly with the rest of your home décor as well as nearby electronics such as speakers, AV receivers, etc. There are multiple controls on the front, including two knobs for bass and treble, as well as a master volume control. Phono inputs are provided so you can hook up a turntable and spin some good old vinyl on the platter. The dedicated headphone amplifier means that you will receive a significant audio boost while listening to your favorite artists on the headphone– we recommend you to try metal or rock music. Some Bluetooth or WIFI connectivity options would have been nice, but this integrated unit is already offering so much at this price, which is way more than what you probably need anyway. This is a symmetrical power integrated amp and features a clean ground construction with an extremely well-built power supply circuit that delivers clean, noise free electricity to all of the components. There is a source direct mode and an auto power-off function, along with a trans-stabilizer to keep the audio clean and distortion free. There is a speaker A/B selector, as well as an A+B selector. Aluminum panels protect the interiors, and you get 50 W of clean, distortion-free continuous power per channel. Despite the lack of a 192 Hz sampling rate in the DAC, this integrated amplifier can output some pretty serious audio. It actually has a sampling rate of 176.4 KHz available on the coaxial, and all the other inputs are limited to 92 KHz. The all-digital input can come in handy for CD players, computers, Blue-ray players, etc. There is barely any distortion in the output, and the amp generates 50 W of power per channel, which is plenty for driving the speakers on your home theater PC setup or even a gaming PC audio system (stereo only, no surround). If all you need is some extra punch from your speakers, and a hub to plug in all your RCA cables, audio lines, etc. 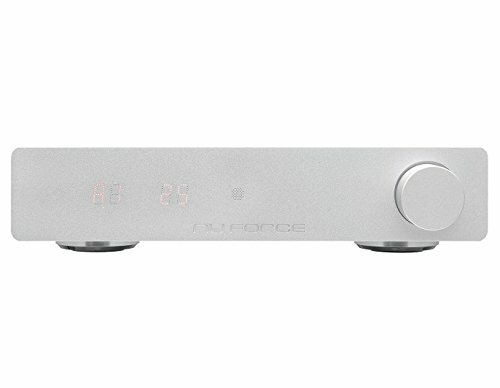 then the Technical Pro IA25U integrated amp might be the right choice for you. It boasts a peak power output of 600W, which means that its actual RMS power output should be 300W, divided by 2 channels- 150 W per channel. Not at all bad for a sub-100 dollar integrated amplifier. The front panel controls allow you to tweak the volume, bass, and treble, with a separate knob to select the input channel. If you want a simple plug-and-use type of integrated amplifier for your home theater PC, then this might be the right choice for you. It is an extremely compact and simplistic integrated amplifier with just one control knob on the front panel. This knob can be used to change the volume, and you’ll also find two AUX audio ports nearby. In the ear, you’ll find an asynchronous USB input, 4 speaker-out lines arranged in R/L configuration, an optical analog input, and a DC output jack. This budget integrated amplifiers design is simple, yet effective. At first glance, the OSD Audio PA-90 might seem like it has too much stuff going on in the front panel. You’ll find LED’s, knobs, and buttons. But with a closer look, you’ll realize that you are basically getting all the controls right on the front of the device. No more need to fiddle around with an annoying remote. Just the way we simple folks like it, sporting mechanical knobs and a black finish. There are three knobs for each of the microphone inputs, along with 3 AUX channel control knobs. Then you have the bass, treble, and master volume control. There is voltage overflow indicator, right above the power button. So what should you look for in an integrated amp? I/O ports (digital and analog) – For digital, we have the optical and RCA cables (coaxial). USB ports (type A and type B) and Ethernet ports also come in the digital input/ output category. For analog, you have the phono inputs (needed to connect turntables), AUX jacks (3.5 mm for headphones and microphones), and XLR ports (used to connect high-end microphones, guitars, etc.). Wireless connectivity – Bluetooth, Airplay, and WIFI. These come in handy if you plan on wireless sync and multi-room playback. Even while using speakers in the same room, the absence of wires and unnecessary clutter can be really useful. Amplifier power – This is not as important as some people think since to get twice as much sound as you are currently getting, you would have to pump up the power ten times as much (basic amplifier math). So don’t make this your only point of focus while deciding between two models with similar I/O and connectivity specs (those come first, the power). Most desktop speakers or bookshelf speakers rarely need more than 10-15 W of continuous power, although some speakers designed for larger rooms might need more. Speaker sensitivity, impedance, etc. also play a big role in deciding how loudly it can play with a given amount of power. Integrated woofer – This is a really neat feature that can transform your mono or 2-channel stereo speaker setup into a much fuller 2.1 channel setup, if you don’t already have a dedicated woofer then the integrated woofer in your new amp will be really useful since you will finally be able to truly enjoy movies and games.